Recently we showed you how to style the WordPress comment form, and we thought it would be incomplete if we did not write about styling WordPress comments layout. In the past, we have discussed that there are default WordPress generated CSS classes and IDs to help make it easier for theme designers to style their templates. 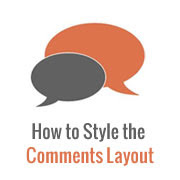 In this article, we will be using those default classes to show you how to style your WordPress comments layout and some of the cool things you can do with it.